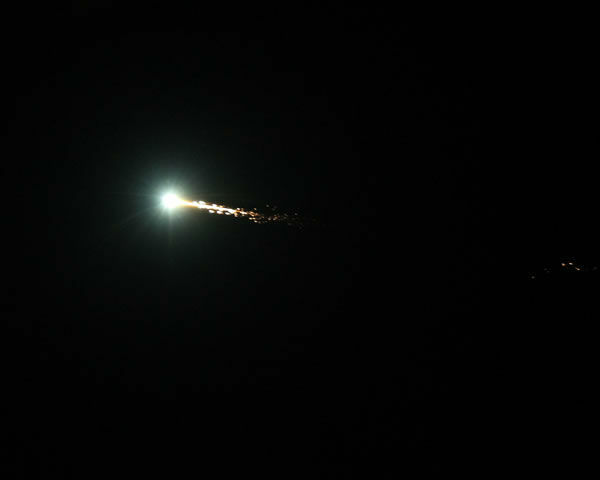 A meteor caught on camera over the San Francisco Bay Area in October 2012 (Credits: Bob Moreno). With so much attention focused on cosmic events in the past week, reported sightings of meteor fireballs are on the rise. Between concerns about safety of the close passing asteroid 2012 DA14 and the devastating meteoroid that hit Russia, more people are paying attention to the sky. Californians and Cubans are among those who found something to report. San Francisco Bay Area stargazers caught the trail of a meteor that likely splashed into the ocean in front of the Bay on Friday, February 15. “Apparently there was another bright meteor seen in the sky, maybe not as bright as the one seen in Russia,” said Conrad Jung, astronomer and Observatory Coordinator at Oakland’s Chabot Space & Science Center, on the local news. Twitter users reported seeing a bluish flash of light for 10 to 20 seconds at about 8 PM local time. Other sightings were reported throughout the Bay Area. The meteor was even caught flying across the Peninsula on a video by the dashcam of YouTube user caiden915x. Gerald McKeegan, an astronomer with the Chabot Space and Science Center, could not confirm the sighting, but the Center received phone calls from people who reported spotting the meteor flying west. The event could have been what astronomers call a “sporadic meteor,” i.e. one that is not associated with a particular meteor shower. These events can happen several times per day mostly over the oceans. When they fall to Earth and go through the atmosphere, they burn up, causing a bright flash similar to the one observed in the event in Russia. The Bay Area is not new to such events. Another fireball landed in the Bay Area in October 2012, causing a loud sonic boom, exploding, and spreading meteorites in the North Bay. Although not caught on video or by photograph, local TV stations reported yet another meteorite explosion over Cuba, about 20 hours before the event in Russia took place. Witnesses reported an explosion that shook the houses in Rodas, a city in the Cienfuegos province. The residents have described a bus-size bright light before the explosion in the sky. No damages or injuries have been reported. According to The Guardian, the Cienfuegos province witnessed a similar phenomenon in 1994.